As technology is being upgraded every day, our daily life is changing rapidly and we are now so much dependent on technology. At the same time, we are forgetting and giving up some arts and practices because of having a busy lifestyle. Canning is one sort of those arts and practices. Having the advantages of refrigeration, the practices of hot water canning has been reduced. Still jams and jellies, people started thinking of canning as sort of a hobby. Moreover, many people are now showing an interest in learning this art. Canning is the way to preserve food from spoilage in order to use it later. Drying, freezing, canning are some methods of preserving foods. As drying is an ancient process, it has become obsolete. Whereas, Canning is a comparatively more upgraded method of preserving foods. Hot water canning sometimes implies the boiling water method, is the simplest and easiest method for preserving high acid food. Most of the fruits have high acidity. So, most of the fruits are included in this category. Pickle vegetables are included in this category. Therefore, we need to make them safe in order to prepare for hot water canning. We can change the acid level of low acid foods by adding an acid like vinegar, lemon juice or citric acid. A white powder evicted from the juice of acidic fruits like lemons, limes or pineapples. We have more example of low acid foods like pickles, which are made from cucumbers, relish came from zucchini or summer squash and green beans flavored with dill. Very recently, Tomatoes entered this category. 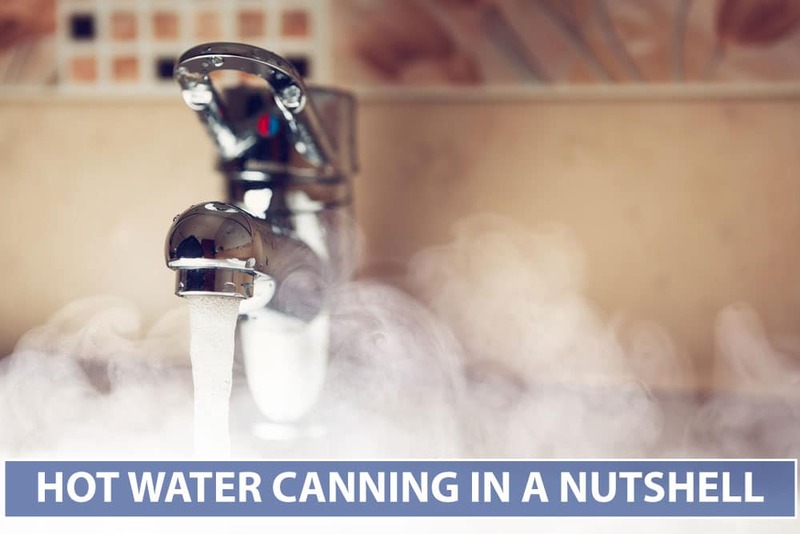 They can be hot water canned. Still, for safety’s sake, we need to add a form of acid to them. If you are not able to confirm the processing method from the food, do not guess. Rather, use litmus paper to test the PH level of your food. If the value of PH is 4.6 or lower, use the hot water canning (water bath canning) method. If the value is 4.7 or higher, it is not applicable for hot water canning, then you need to apply the pressure-canning method. Always use food of maximum quality when you are canning. If you take less than the best, you cannot reach the quality you are looking for. Cautiously sort through your food, discarding any pounded pieces or pieces you would not take in the raw state. Follow the instructions in your recipe for readying your food, such as removing the skin or peel or cutting it into pieces. Similarly, prepare your food according to the instruction given in your recipe. Do not bring any adjustments ingredients or quantities of ingredients. Any alteration can change the value of PH of the product, requiring pressure canning instead of hot water canning to kill microorganisms. If your recipe states something specifically, it is the reason behind this happening. Again, if you do not go through the recipe instructions to the letter, the results won’t be what the recipe intended. Every aspect of hot water canning procedure is equally important. So, we cannot skip anything, no matter how trivial it seems. You will only have a safely processed product for using later when your food and canning techniques came to perfection means techniques are in perfect harmony and balance. The following section will help and guide you through the systematic process for creating delicious and high-quality homemade treats. Keep practicing proper kitchen and cleanliness. Rinse off any soapy residue. Fill the kettle one-half to two-thirds fall of water and begin healing the water for at least 10 minutes until you are ready to fill them set. Set the clean bands aside and put the lids in hot but not boiling water. In a saucepan, separating them from your jars protects the lid sealant. Next, prepare your food exactly as the recipe tells you. After preparing your food, pour it into the hot jars. Leaving the amount of space stated in your recipe. Press back gently on the contents going all the way around the jar. Add more food to the jar after releasing the bubbles if necessary. No air bubbles and proper headspace ensure a proper seal. Swap the jar rims with a clean damp cloth. Put a hot lid onto each jar. Ream sealant side touching the jar, rim,and hand tightens the screw band. Hang your jar rack on the inside edge of your kettle, still filled with hot water and place full jars in the rack. Make sure, they are upright and not touching each other lower the rack into the kettle. Cover the tops of the submerge jars with one to two inches of hot water. You can add more water from teakettle or pan. Cover the kettle with the lid and bring the water to a boil. Remove the jars from the boiling water. The jar lifter places them on a clean kitchen towel anyway from drafts. Do not adjust the bands or check the seals. You should hear a ping when the jars seal. After about an hour, you can check the seal by pushing on the center of the lid. If the lid feels solid and does not push down, you have a good vacuum seal. If the lid pushes down in the center and pops, the jar is not sealed. If that is the case, refrigerate and use them within two weeks or as stated in your recipe. There is a good seal no need to refrigerate. Label jars with the food and date. You can then finally store your jars in a cool dark place. It is very much essential to adjust your processing time when you are canning at an altitude higher than 1000 feet above the sea. As the air is thinner at higher altitudes, water boils below 212 degrees. Therefore, you have to process your food for a longer period to kill any microorganisms that can spoil your food. When Processing time is less than 20 Minutes: Add 1-minute additional time for each additional 1000 feet of altitude. When Processing time is more than 20 Minutes: Add 2-minute additional time for each additional 1000 feet of altitude. If you disable to know your altitude level, you can easily get this from different sources. By contacting the public library, a local college or the cooperative extension service in your country or state. Checking your local phone book for a phone number or visiting online is some easier way to know your altitude level. Freshness and Purity: It is completely free from chemical and artificial preservatives, which often cost our life. As it is a natural process, canning food contains the freshness and purity. Therefore, it is hygienic. Economical: Nowadays, the Price hike is a great problem. Having a pantry can really help from this trouble. We can preserve food for more than one year throughout canning method having a storeroom. We can be benefitted economically as well as can provide work to resolve the unemployment problem. Easy Solution: If you have any doubt or curiosity with your own food, then canning is the easy solution. So, go for canning of your own food. Relaxation and Accomplished: Passing time in the kitchen or passing leisure with cocking, many people feel relaxed. This one sort of hobby too. The effort you give will bring the accomplishment. At the same time, friends and family can also enjoy your products. Hot water canning is the easiest method for preserving high acid food primarily fruit tomatoes and pickled vegetables. The price of the food has skyrocketed in recent years. Canning is the answer to both the price fix and the choice to allowance nutritious foods throughout the year. Hot water canning and preserving instantly rewards your efforts when you pursue the proper steps for processing your food. Copyright © 2018 - Showerar. All Rights Reserved. Showerar.com is a participant in the Amazon Services LLC Associates Program, an affiliate advertising program designed to provide a means for sites to earn advertising fees by advertising and linking to amazon.com. Amazon, the Amazon logo, AmazonSupply, and the AmazonSupply logo are trademarks of Amazon.com, Inc. or its affiliates. Additionally, Showerar.com participates in various other affiliate programs, and we sometimes get a commission through purchases made through our links.